If you’re studying math or science, you are probably pretty familiar with Wolfram Alpha as a tool for figuring out complicated equations. That makes it a pretty good tool for cheating, but not necessarily for learning. Today, the Wolfram Alpha team is launching a new service for learners, the Wolfram Problem Generator, that turns the “computational knowledge engine” on its head. The Problem Generator – which is available to all Wolfram Alpha Pro subscribers now – creates random practice questions for students, and Wolfram Alpha then helps them find the answers step-by-step. Right now, the Generator covers six subjects: arithmetic, number theory, algebra, calculus, linear algebra and statistics. 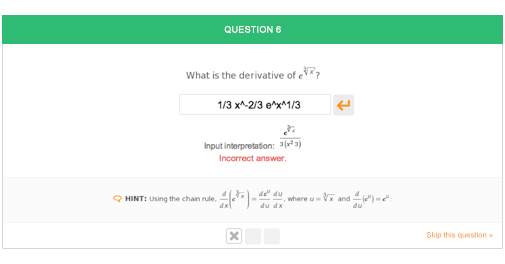 The difficulty of the questions can be tuned down for students in elementary school and tuned up for those in college calculus classes. As the company notes in today’s announcements, the material for students in elementary and secondary schools closely follows the Common Core Standards initiative. Using the tools is pretty straightforward. Students (or their teachers) choose which topic they want to study and the difficulty level (beginner, intermediate or advanced) and the system will generate a problem. The team notes that the tool uses Wolfram Alpha’s natural language processing capabilities to try to understand the students’ answers to “ensure that all students can learn and express themselves in their own unique way.” This may actually be the highlight of this service. Too often, after all, similar tools force a very rigid way of answering complex math questions on their students and when they make a mistake, it’s not clear if the answer is wrong or if the student just got the syntax wrong. If a student can’t find the answer after three tries, Wolfram Alpha can show a step-by-step solution. The Problem Generator also allows teachers to easily create printable quizzes with multiple-choice tests.